How do we use Alberta Energy Regulator (AER) Directive 39 to control benzene emissions? The energy industry releases a variety of chemicals to the environment. One of the most controversial is benzene. Why? Because this toxic substance (according to the Canadian Environmental Protection Act) leads to leukemia and various other cancer types, and no safe threshold level has been determined for benzene, although Alberta Ambient Air Quality Objective values have been more recently established. The Alberta AER Directive 39, entitled Revised Program to Reduce Benzene Emissions from Glycol Dehydrators and available at http://www.aer.ca/documents/directives/Directive039.pdf - intends to control these consequences by minimizing people's exposure to this chemical. Benzene is found in crude oil and gasoline, has a sweet, light aroma, takes on the form of a colourless liquid and ignites easily. Many types of emissions sources in the petroleum industry release benzene to the atmosphere. The list includes flares, glycol dehydrators, storage tanks and stacks. AER Directive 39 deals with the glycol dehydrators because benzene becomes concentrated during the dehydration part of their industrial processes. The fumes from paint, detergents, gasoline and similar petroleum-derived products have historically contained benzene. This is pure benzene, C6H6, and not to be confused with petroleum ether, a mixture of liquid hydrocarbons (including benzene) commonly called petroleum benzene. Consumer product regulations have led to the mitigation of benzene content in many of these types of merchandise, though. People who smoke expose themselves to quite a bit more inhaled benzene than the average population. In the United States, benzene in drinking water is a concern and the EPA has set a drinking water maximum concentration of 5 ppb and designed airborne benzene as a Hazardous Air Pollutant (HAP). The OSHA (Occupational Safety and Health Administration) set an air quality of 1 ppm for full time workers, with a short-term 15 minute exposure level of 5 ppm in the air. In fact, the US NIOSH (National Institute for Occupational Safety and Health) determined that a concentration of 500 ppm as "immediately dangerous to life or health". Acute exposures, even as low as 50 ppm, can slow down the central nervous system and cause sleepiness or headaches and symptoms resembling drunkenness. Chronic exposure presents a different set of concerns. It can affect the skin if it comes in direct contact and slow down blood production. Problems compound when workers encounter multiple chemicals, such as alcohols and BTEX (benzene, toluene, ethyl-benzene and xylenes) simultaneously. How does AER Directive 39 provide guidance for benzene emissions? Industrial plants and facilities are to maintain systems to stop leaks, use process components that properly control and optimize the movement of these fluids and keep a watchful eye on safe work practices. 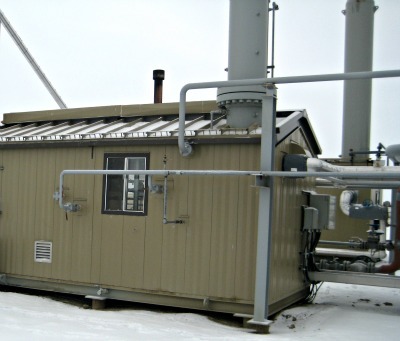 The Best Management Practices for Control of Benzene Emissions from Glycol Dehydrators - http://documents.mx/documents/control-of-benzene-emissions-from-glycol-dehydrators.html from the Canadian Association of Petroleum Producers (CAPP) outlines how technical decisions are to be made regarding the use of benzene-containing processes. Employees are to receive adequate training for their positions, use PPE (personal protective equipment) correctly and keep aware of their surroundings, usually with the help of monitoring equipment. Site emissions are to remain within benzene emission limits, given in units of mass per year, according to the age of their equipment. This section of AER Directive 39 is quite detailed and must be followed exactly. Benzene emissions are to be calculated using a Dehydrator Engineering and Operations Sheet (DEOS) for each unit. Once devised, this worksheet requires frequent attention during plant and unit operations. Plants must also prepare a Dehydrator Benzene Inventory List every year and send it to CAPP via the Technical Advisory Team (the Benzene TAT). The AER has the power to take action against non-compliant facilities as outlined in AER Directive 019: AER Compliance Assurance—Enforcement. Air dispersion modelling - To support all interactions with the government. Please call Barry J. Lough at Calvin Consulting Group Ltd. at 403-547-7557 for dispersion modelling or help with any air quality questions you might have. Thank you. We need to watch and reduce environmental toxic releases. The Alberta AER Directive 39 gives us helpful regulations and guidance for reducing emissions of benzene .